SELF-ASSESSMENT COLOUR REVIEWS IN VETERINARY MEDICINE: Each book covers a specialist area of veterinary medicine and the format enables the reader to consider a problem fully and then devise a solution. Building on the great success of the authors earlier book, Volume 2Advanced Cases presents some 255 clinical scenarios in self-assessment format. Coverage includes allergy, alopecia, autoimmune diseases, congenital diseases, neoplasia, viral diseases, parasitic diseases, bacterial diseases, fungal diseases, nutritional and pigmentary diseases. The book also includes an expanded bibliography of general references. The cases appear randomly to reflect real life practice and vary in complexity from the more easily treatable to the most difficult and serious cases. The self-assessment format, featuring questions, top quality colour illustrations and detailed answers and explanations is designed to educate, not just to test. 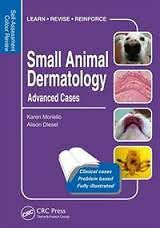 This new volume will appeal to all those dealing with skin diseases in small animals, veterinary practitioners and students, veterinary nurses and technicians.